www.hotrodcoffeeshop.com • View topic - The 1989 Dodge Ram D50 4G63 Turbo Engine Swap. 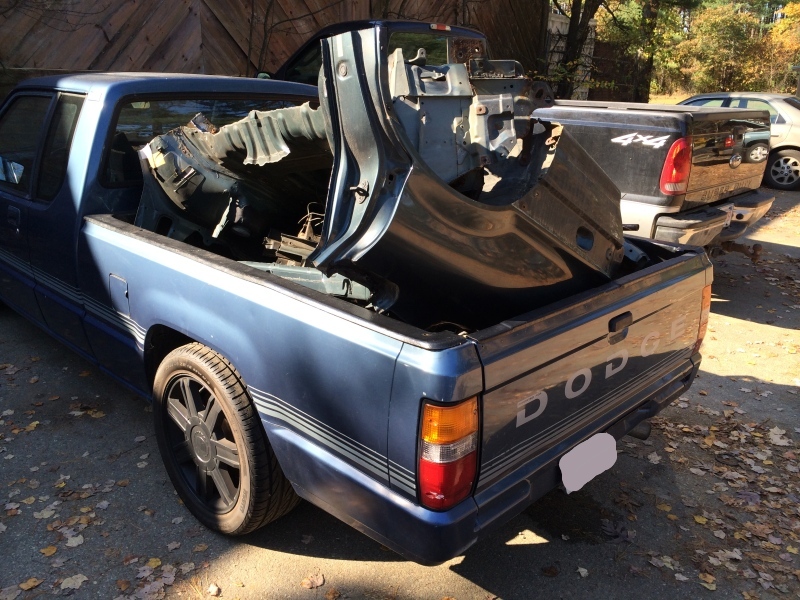 Post subject: Re: The 1989 Dodge Ram D50 4G63 Turbo Engine Swap. I saw that, thanks though. I'm thinking along the lines of modifying the compressor housing, grinding on the block a little and then maybe one spacer. freaking mitsu, would have been really nice of them to make this work out of the box. had they not made 2g/evo intake ports smaller, then moved the injectors to the intake manifold on the evo, the intake manifold would be a direct bolt on. Good engineers try to plan for fun interchangeability, bad engineers dont plan for modular designs and make things annoying. Yes, you can probably get away with grinding away the compressor housing and grinding the block. I just preferred the extra spacer because it would involve less wrestling with parts. Be sure to take pictures when you do this work, because I would love to see how you end up doing it. 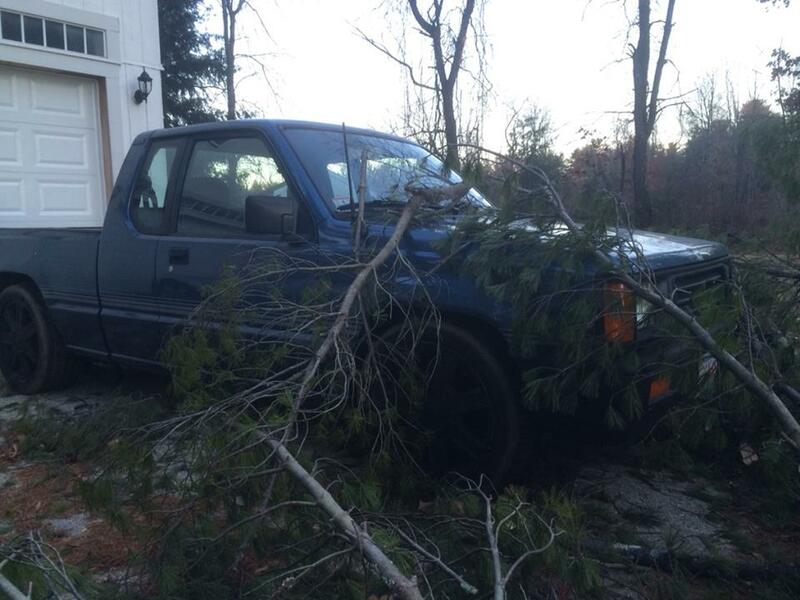 So it was windy in Massachusetts on November 24th 2013, and a tree fell in my yard, and hit my truck. The hood is beat up, but the rest survived. 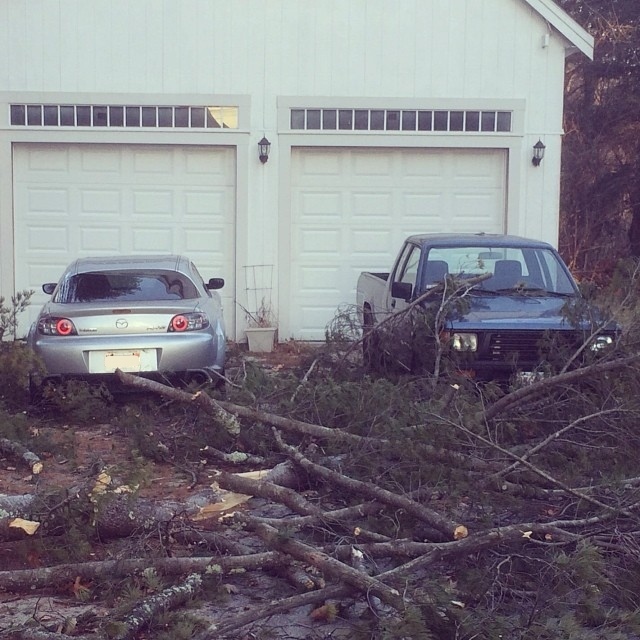 It protected the RX-8, so it wasn't in vain. Well, its really for sale! Worth every penny. I'll help spread the word. And I bet you could get more than that for it! Maybe! I'd be thrilled to get that price though! Someone is going to get one hell of a truck! will it come with a copy of the magazine?????? If you pay full price, it will come with a copy of the magazine I may regret selling it some day, but if I do sell it, it gives me opportunity to build other stuff, which allows me to learn more. That's what I'm ultimately after! This truck would look great at our local cruise ins, with me in the driver seat of course! I totally understand your car ADD, good luck! and I hope it sells fast, on another note....... I cant WAIT to see what you build next!! Haha! Me too! Thanks guys!